Workers seen by a monument to Prince Vladimir in Moscow. A monument to the Baptizer of Rus due to be erected outside the Kremlin walls may threaten the citadel’s UNESCO status – but this is not the only reason the initiative to install the 16-meter monument has resulted in controversy. 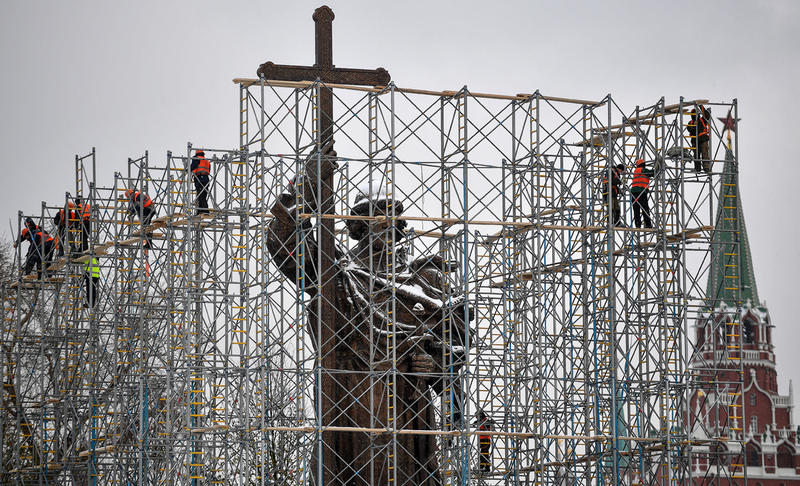 Controversy continues to plague a monument to Prince Vladimir, the man who introduced Christianity to Russia in 988, which is due to be unveiled on Nov. 4 on Moscow’s Borovitskaya Square, near the Kremlin. The history of the 26-meter monument to Vladimir (who is also known as Vladimir the Baptist, St. Vladimir and Vladimir the Red Sun) was accompanied with protests and heated debate from the very outset. The idea to install the monument was initiated by the Russian Military-Historical Society (RVIO), which is headed by Russian Culture Minister Vladimir Medinsky. Early last year, the Society held a competition for the concept of the future monument: The design for a 24-meter (80-foot) monument proposed by Russian sculptor Salavat Shcherbakov and architect Vasily Danilov won the secret ballot vote. Opponents to the monument stressed that Vladimir had no relation to Moscow, because the first known mention of the city dates back to 1147, that is, a century after the prince’s death. In addition, historians emphasize the brutality of Vladimir, who, after capturing the town of Polotsk in 980, raped the daughter of Polotsk prince Rogneda and then forcibly took her as his wife. He also singlehandedly killed her father and two brothers. Critics also highlight the political aspect of the monument to Vladimir, which is associated with Russian President Vladimir Putin. For example, prominent anti-Kremlin journalist Oleg Kashin notes that the monument to Vladimir can also be seen as a tribute to his influential namesake. In addition, Shcherbakov's sculpture in its original version was to surpass the height of a 20-meter monument to Vladimir in Kiev. In the context of the Russian-Ukrainian conflict, this was also seen by observers as a political gesture. The opening of the monument was supposed to coincide with the millennium of the death of Prince Vladimir on Nov. 4, 2015. The RVIO management proposed to place it next to Moscow State University in the Sparrow Hills nature reserve. However, the geological condition of the place did not permit the installation of a sculpture weighing 300 tons on the banks of the Moskva River out of fear of landslides. Dissatisfied with the RVIO's initiative, Moscow residents and conservationists created a petition against the installation of the monument, which collected more than 80,500 signatures. Eventually, the city authorities offered residents a number of alternative sites in the city center –Moskvoretskaya Embankment and the Lubyanskaya and Borovitskaya squares. During the vote on the government-run Active Citizen website, locals supported the latter option. The Moscow City Duma's Commission on Monumental Art approved the location. However, this decision did not suit conservationists: The site at the intersection of Mokhovaya and Znamenka streets, where the statue of Vladimir is to be installed, is part of the Moscow Kremlin's protected zone, and any new construction there is forbidden. Earlier this year, UNESCO warned the Russian authorities that in case of non-consultation regarding the historical landscape and non-compliance with the Convention concerning the Protection of the World Cultural and Natural Heritage, the Moscow Kremlin will lose its status as a World Heritage site. As a result, the authors of the monument agreed to reduce its size: Now the height of the prince's figure will be 12.2 meters, so the height of the monument including the cross will not exceed 16.8 meters. Another UNESCO requirement was the comprehensive beautification of Borovitskaya Square with the involvement of international participants. In April of this year, the authorities announced the winner of the contest for the concept of reconstruction of the square. The winning design, by the Russian architectural bureau AI-Architects, involves creating on Borovitskaya Square a stepped slope, symbolizing the waters of the Dnieper River, where Prince Vladimir baptized Kiev. "An interesting idea has been proposed: We see a drop which, as if falling into the water, goes around in circles, creating an association with the ritual of baptism," said Sergei Kuznetsov, Moscow's chief architect, explaining the concept. However, Rustam Rakhmatullin, coordinator of the Arkhnadzor public movement, does not believe that either decision can be called a compromise. "UNESCO considers the design of the monument to Vladimir solely in terms of its impact on the Kremlin," the conservationist said in a conversation with RBTH. "However, it poses a far greater threat to the adjoining monument of Russian classicism, the Pashkov House, which is not included in the World Heritage list. The statue will block the historic view of the building from the side of the Kremlin – the fact that the size of the sculpture has been reduced and that it has been shifted along the axis of the central colonnade of the Pashkov House will not help. This monument just should not be here." Arkhnadzor assessed the probability that the Kremlin will be deprived of the UNESCO World Heritage status as minimal. "All UNESCO prescriptions to the Moscow authorities were oral – in reality, they have not been recorded anywhere and do not oblige those who will be installing the monument on Borovitskaya Square to do anything," Rakhmatullin added. "Consequently, there are no formal reasons for sanctions by UNESCO." Russia must send a report on the results of the installation of the monument to Prince Vladimir to the World Heritage Center of UNESCO by Dec. 1.